When thinking about the role that art and creativity play in preparing our young people for the future, who better to ask than young people themselves? We are excited to introduce this week's Next 20 community builders: Grade 9 students Nellie Sun, Ann Ping and Lydia Sochan from Churchill Secondary in Vancouver. Together they form LiveWritePaint. We met LiveWritePaint last Fall when they approached ArtStarts with their fundraiser idea and hosted an art show where 100% of sales of paintings made by local artists would be donated to ArtStarts in Schools. Nellie, Ann and Lydia are passionate about the role that the arts and creativity play in their lives, their school and society. Lydia: I think it's making lemonade out of lemons. It's taking the circumstances that you have and manipulating them to create something new. Nellie: Creativity is courage. It takes bravery to be different from people. In history, artists decided to experiment with different styles and work. Sometimes they weren't appreciated by society but I really admire how they were brave enough to still be so different and stick with the changes they wanted to see. Nellie: Creativity in my life looks more toward problem solving, using unconventional methods to solve a problem. For example, if I get a really hard question on a chemistry test or a question on a math test that I can't solve, then I try and use different elements and methods that I have and be resourceful with it until it works. Lydia: Emotion. If you don't feel like you can express emotion, then you won't do art. But if you are taught that emotion is a natural thing, a good thing, a beautiful thing, then you're probably more likely to turn to art. Nellie: I think it's about being given space, because I know I'm really busy every day but because I have art class, it gives me time to experiment with things and a place where I can just go. Sometimes when you have that space you create something that you didn't even know was there in the first place. For example in music class, we have combo groups and play harmonies for each other, then make up a solo. It was really scary at the beginning, but now I can do solos, which I didn't know was in me. Nellie: I think it's the judgement that society casts upon you, and how you're scared of the judgement that you'll face. It's really hard to be different, to try and change and do something new and face what others might say. I feel like sometimes teachers also inhibit creativity—yet it depends on the teacher. For example, if a teacher always gives you formulas and tells you to memorize them and gives you tons of tests, it doesn't teach you how to be the person who found the formulas in the first place, which is the most important thing. Ann: I think a lot of parents are controlling of their children. They plan out everything for their children and they don't give them time to do what they want to do. It ends up limiting their opportunities. When they don't have enough opportunities, they don't have experience in expressing emotion, and you can't do a lot of art. How would you like to see classrooms evolve? 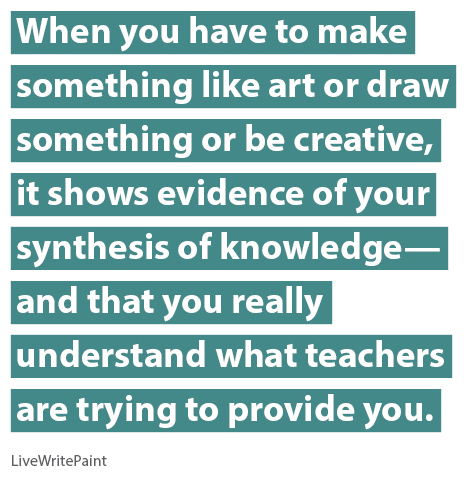 Nellie: I feel that teachers can really tap into art because when you have to make something like art or draw something or be creative, it shows evidence of your synthesis of knowledge—and that you really understand what teachers are trying to provide you. If you're just simply memorizing things for a test, most of the time you'll forget it the next day, but if you do something with your hands it will stay with you for your whole life. Lydia: We need teachers who can guide us, provide us with a direction to go toward but don't tell us exactly how to get there and what to do. We still need a safety net so we don't fall too far off the path. What role do you see the arts playing in education in the next 20 years? Nellie: Creativity is very important for the next 20 years and the future. We're getting stuff like virtual reality and technology and robots developing right now and 10 years ago we never could have dreamed that people would come up with those things. With creativity they were able to come up with so many new ideas that innovate our society. It will be more like that in the future: we're always trying to push our boundaries of what we can do as a society. It will be really important to have creativity and the ability to come up with new ideas that can change the world, so I feel that art is important in that way. What skills do you feel you need to thrive in the future? Ann: A positive mindset so we're eager to learn and eager to get a job and have a good future. Also, perseverance. We shouldn't give up. Even if we make mistakes, they just help us learn. If we didn't make mistakes we wouldn't improve. Nellie: The ability to take risks and to be brave. If you can't take risks then you'll be holding back your full potential. Also, being brave. It's really important to break society's stereotypes. Sometimes society tells people to stop pursuing their passion, but being brave and standing up yourself will really take one far. How do you feel that being creative and artistic today will help you in the future? Lydia: If you learn to express yourself from a young age through creativity, then when you're older and encounter difficulties, it's going to be easier for you to deal with that because you know how to express your emotions, instead of bottling it up inside. You need to learn how to deal with your challenges and creativity can help with that. Ann: If we are creative and artistic during our childhood, we have more experience in expressing ourselves and finding ourselves. It builds up confidence and independence. Nellie: If I end up going into law, it would take a lot of strategy to get to a solution for a case. Creativity allows you to be unconventional with your strategies. Art is also really fun! It's great to take a break from work and pluck some strings or to paint something. It's a great way to relieve stress and it’s very therapeutic. Art really does make you happy. It really teaches you to enjoy every moment of your life and that every moment is worth capturing and remembering instead of just wasting it. If you appreciate life like that, you'll be a happier person.